Do you have trouble with your cakes and muffins sticking to your pans? Why not make your own Cake Release-type product? It is a fraction of the price of Wilton's Cake Release - and works even better than Baker's Joy! Once you make it, store it in an airtight jar and when you are ready to use it, just paint it on your pan with a pastry brush. Whip mixture until smooth, and store in airtight container at room temperature. 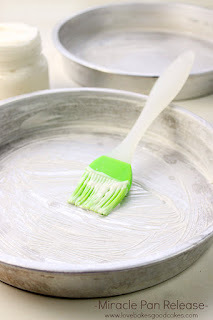 To use, dip a pastry brush or clean fingers into the mixture, and spread a thin layer over the bottom and sides of your pan(s) for recipes calling for greasing and flouring of your pans.